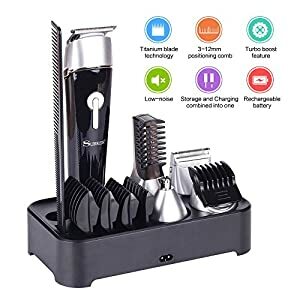 5 in 1 Multi-functional Man’s Grooming Kit equipped with 5 Different Attachments Heads,including a hair clipper, hair trimmer, nose & ear trimmer, dual shaver and body trimmer.let you achieve your best grooming style and authentic look. 4 haircut positioning combs:Trim your hair to exactly the length you want, by locking in the setting that suits your desired look，you can easily trim hair perfectly with the hair clipper guards. Rechargeable Base: Storage and Charging combined into one, 8 hours charge can support hairstyle shaping working continuously for 40 minutes. 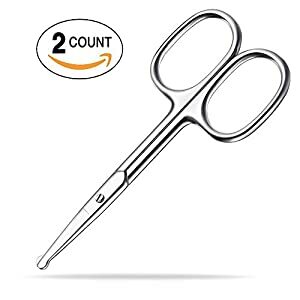 STURDY AND DURABLE- These personal care scissors set are made from 100% surgical grade stainless steel, resist rust and tarnish. Easily maintain, wiping with a soft, dry cloth or dipped in alcohol cloth and storing in a closed position for next use. Improved dual-edge blades use cyclone blade action for quick and efficient trimming – No Pain or Pulling Sensation! 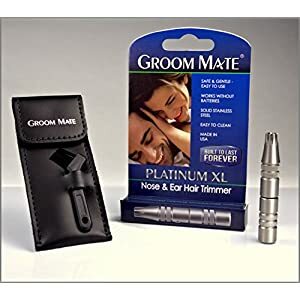 Groom Mate branded nose and ear hair trimmers are considered to be the finest batteryfree nose hair trimmers available today. Groom Mate has been manufacturing these fine trimmers here in the USA since 1991. 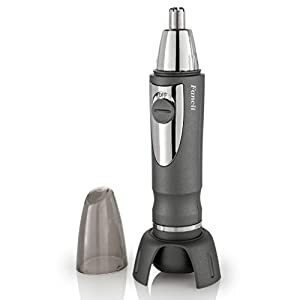 The Platinum XL nose and ear hair trimmer is made from 100 percent stainless steel and has a lifetime warranty. 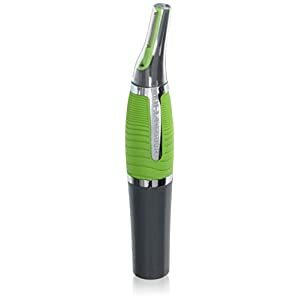 The Platinum XL trimmer has a patented rotary blade system that is waranteed to never dull and to never pull or yank out nostril hairs. 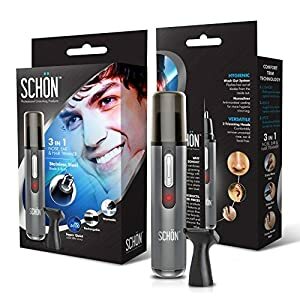 4 IN 1 Hair Trimmer Kit —- It Includes Nose Hair Trimmer, Eyebrow Shaping, Body Shaver, Facial Ear Hair Shaver. Many Functional Trimmer will brings to you the best technology for a painless hair removal experience. Cordless & Battery Operated —- Powered by 1 AA battery, Cordless. You don’t need to worry about the charging problem, very convenient for using it at anytime and anywhere. (battery Not included). 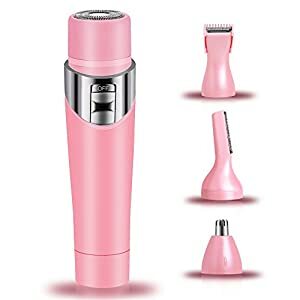 Safe, Efficient, Painless —- There is protection cover on each trimmer head, the blade can’t touch your skin directly, gentle enough on all-type skin. High-speed system will provide an efficient and painless trimming experience for you, no pulling, no tugging, cuts or pain. ✔Stainless steel material, sharp precision design, durable,can be used continuously for tens of thousands of times. ✔No batteries required. Take it and use it anywhere. ✔Safe & painless, cutting blades never come in contact with skin. SHARP BLADES with rounded tips offering precision. We all know there is nothing more frustrating than a dull pair of scissors when you want a nice, clean cut. Problem Solved. INDISPENSIBLE for meeting any number of various cutting needs. It is a great feeling to have the right type of scissors handy when you need them! 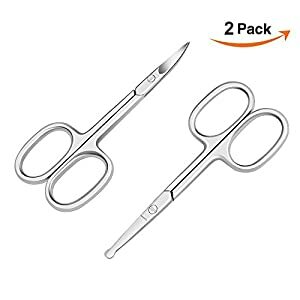 CLASSIC DESIGN Provides Easy and Comfortable Use; An Excellent Pair of Scissors to Travel With; you will love having these scissors handy whenever a need arises! 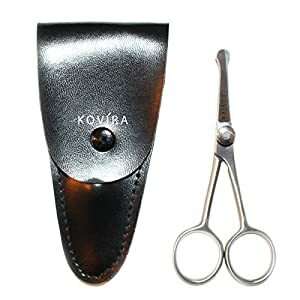 HIGH QUALITY FACIAL CLIPPERS: Our stainless steel scissors are perfect for trimming facial hair. 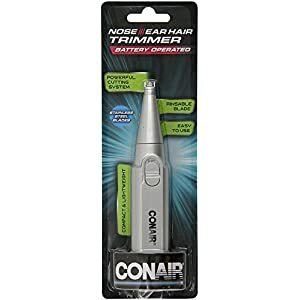 The rounded tip provides safety when cutting up the nose, in the ears or trimming eyebrows. 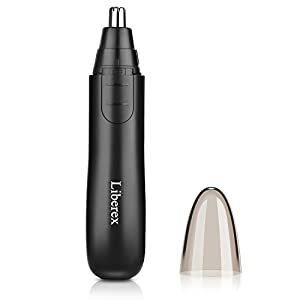 The rounded tip makes them very safe and easy to use at home or in the salon. 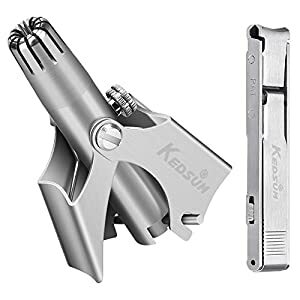 ADJUSTABLE TENSION SCREW: Our scissors come complete with an adjustable tension screw, which enables you to adjust the tightness of the scissors depending on what you are using them for. There is nothing these little scissors can’t do. HYGIENIC: Whether you are trimming your beard, moustache or hangnails it’s important to have clean and safe scissors. As our scissors are stainless steel, they are easy to sterilize and clean. They also come with a case so you can store them away safely for their next use.